WHILE Twitter diplomacy may have a few merits, tweets may not be the best medium to announce policy decisions regarding sensitive matters of global importance. However, the incumbent of the White House quite obviously disagrees with this notion, as Donald Trump’s recent tweet on the Golan Heights has proved. “After 52 years it is time for the United States to fully recognise Israel’s sovereignty over the Golan Heights. ...” President Trump tweeted recently, eliciting a strong response from the Middle East. It seems the fact that the Golan is Syrian territory illegally occupied by Israel — and recognised by the world as such — matters little where the US leader and his coterie of pro-Israel hawks are concerned. While the Israelis reacted gleefully to Mr Trump’s act of ‘generosity’, others in the Middle East weren’t quite so pleased. Syria itself has said that Mr Trump’s action “reflects the United States’ contempt for international legitimacy” and “blind bias” towards Israel. The Arab League, Turkey, Iran and Russia have also slammed the American move strongly. The fact is that Mr Trump’s move is part of a familiar pattern of appeasement of Israel and disdain of Arabs in general and Palestinians in particular. 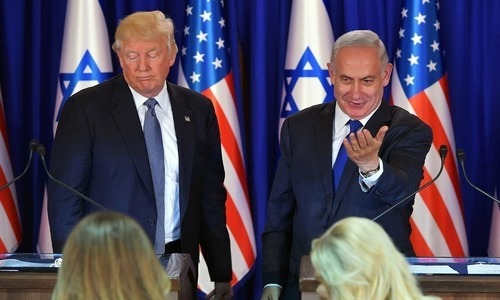 This is only the latest in a series of moves emanating from the Trump White House to have exposed the current US administration’s true inclinations in the Middle East. For example, late in 2017, the US ‘recognised’ Jerusalem as Israel’s capital, going against international consensus that the holy city is disputed territory; this year, the decision to ‘merge’ the US consulate in Jerusalem (which principally dealt with Palestinian affairs) with the American embassy was also seen as a snub to the Arab side, while Washington’s support for illegal Israeli settlements is perhaps at its highest level ever. The message from Mr Trump seems to be one of denigration of Palestinians and granting legitimacy to the Israeli occupation. The Zionist state has a voracious appetite for Arab land; Mr Trump and his team in Washington are creating an enabling environment where Tel Aviv can take what doesn’t belong to it, and get away with it. 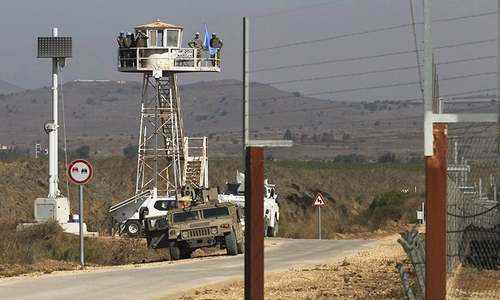 However, as observers have noted, the latest move of ‘gifting’ the Golan to Israel is likely to fuel more violence in the region. Thus, any peaceful solution to the Arab-Israeli dispute at this point seems remote, and more turbulence is the likely fate of the region. Do Trump and Netanyahu have a mutually beneficial relationship? Why are you silent on South China Sea dispute, when China grabs entire stretch ? Still Arab leaders consider Trump as their savior to keep them in power despite all these humiliations. Nothing new about their decision, they have nurtured that country for 70 years. They defy international opinion because we are divided, period. @Gibraltar, Arabs rulers are protecting their own power and interests, and not those of Muslims. I fully agree with the editorial. @Nadeem Yousuf, : What has 'Muslim' got to do with 'Arab'. Unless you separate the two and stand up with your faith, nothing will change. Syrians had been aggressors who were defeated by Israel. 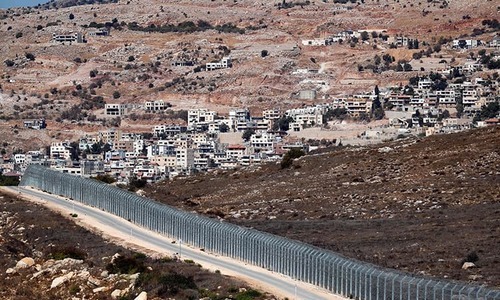 There is no question as why israel should even think of returning Golan heights. @Nadeem Yousuf, are Arab leaders obliged to protect "muslims" or their citizens? But any idea where are the Jews that once lived in Middle East? Russians are no one to talk, seizing other's territory and invading Afghanistan. @Gibraltar, --- Kuwait had to be saved from Saddam Hussein. There have been more dictators in the Middle East than in any part of the world. @Azhar Hussain, .... Egyptian opinion is with America, except for the Egyptian brotherhood. @shirish warke, ... The Syria army also invaded Lebanon, not the Israelis. International consensus 'going against Donald Trump 's generosity to Zionist state' . Wonder why oil rich Arab autocratic rulers especially the El Saud of SaudiArabia are so woefully quiet. @RAja Raman, Read and educated yourself before commenting. This is occupied territory to be decided by the UN. Whereas Chinese are not occupying but claiming their economic zone. Then again what to expect from Indians. It is established fact that Mr Trump has acquired second nature to float in media all the time by raising disputed matters. Now, no one taking him seriously even in his own country. He needs to contribute towards peace rather than fomenting hatred. Trump's animosity against Muslims n Islam is open. The Muslims should need to be united failing this he wd continue to damage Muslims cause. OIC should activate n represent in real term the Muslims cause. Unfortunately, the racist, bigot, prejudiced, liar and biased Donald Trump in pursuit of his 2020 Presidential campaign's solo goal of reelection, has disgracefully crossed all limits and boundaries to ignore, isolate, shun and bulldoze international law as well as dozens of U.N. resolutions in favor of Israel and to support the reelection campaign of the cunning, cruel, wicked, brutal and shameless Netanyahu and his crooked and criminal cronies. Those who lived there first should get the land even that thousands year old affiliations.